The Basics Plus aluminum thumb-release bipod features adjustable legs and simple locking. 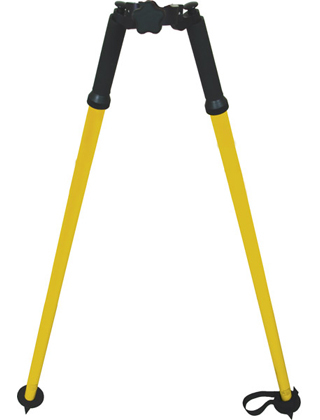 It's simple for a surveyor to set up a freestanding prism pole or GPS pole. The bipod head will accept 1-to-1.25 inch (25.4-to-31.8 mm) OD poles through the front and 1.5-inch (3.81 cm) OD poles through the top. The legs independently extend 6 feet (1.8 m) and collapse to 43 inches (109 cm). Weighs 4.2 lb. Includes Limited Lifetime Manufacturers Warranty.